Nearly all the food on this year’s menu had a fun Halloween twist. We drank blood punch and ate like royal vampires: witchy cupcakes, bat brownies, spidery meat and veggie trays, mummy dogs, dirt-cake graveyards, and webbed taco dip. Then there were the sugar cookies that looked a bit too much like severed fingers (some had bloody jelly inside). Crock pots were steaming full of pulled pork and chili, so no one left this party hungry. She was an experienced Potions Master, but sadly the children were not. The witch was kind but critical as the children tried their best to master the recipes in her book! It wasn’t easy! It was hard to pull the kids away from the Potions Room, but we had to start the scavenger hunt before dark. Our friendly witch spent her afternoon hiding scary objects throughout the neighborhood: a spider, a ghost, a bloody knife, a key, a mask, a bat, a lost witch’s hat, and more. Each item came with a rhyming clue that led them to the next object, and the kids had to stay together as they searched. At the end of the scavenger hunt, each child held a spooky object that doubled as a ticket into Activity Number 3: the Haunted House. Unfortunately we don’t have any photos of the haunted house. It was by far the most terrifying part of the party, and most kids didn’t have the courage to enter twice. It was set up in the garage, a space transformed by black visqueen into three distinct rooms. In the first room a cackling witch (not our hostess – a much meaner witch) sat at a table with three cauldrons, and she required all haunted house victims to stick their hands into each of them before continuing to the second room. The cauldrons held intestines, bat brains, and eyeballs – yuck! As the kids timidly touched these contents, a disheveled chef moaned and limped aimlessly through the room. There was blood on his coat, brains protruding from his hat, and intestines spilling out from his stomach. Luckily this evil witch had a magical ball, and she allowed the children to touch it for the necessary strength to move into Room 2. Room 2 seemed harmless enough. It was very dark, other than one glowing creature sitting in a corner chair. He was moving a bit, but clearly stuffed and harmlessly alone. We don’t have any pictures of the mummy (proudly played by Clark) but he was wrapped in gauze from the waist up and had a fair amount of blood on his face. He was glow-in-the-dark horrific. After the mummy experience, the kids were ready to bolt for the exit. But just before they could escape, Old Man Lawry jumped out and shrieked, “BE SCARED! !” with all his might. Yeah, they were scared. Old Man Lawry has a pretty petrifying scream! We meant to take a group shot with Waldo hiding in the background, but Dionysus blessed us with too much wine and we decided to skip it and watch the World Series instead. As you can see, this party was fun for kids of all ages. We had a magician in the group, but he had to admit no special spells were necessary at this party. Thank you so much to the head witch who pulled this off… you are generous, creative, and intelligent beyond words. A magical witch of the best kind. 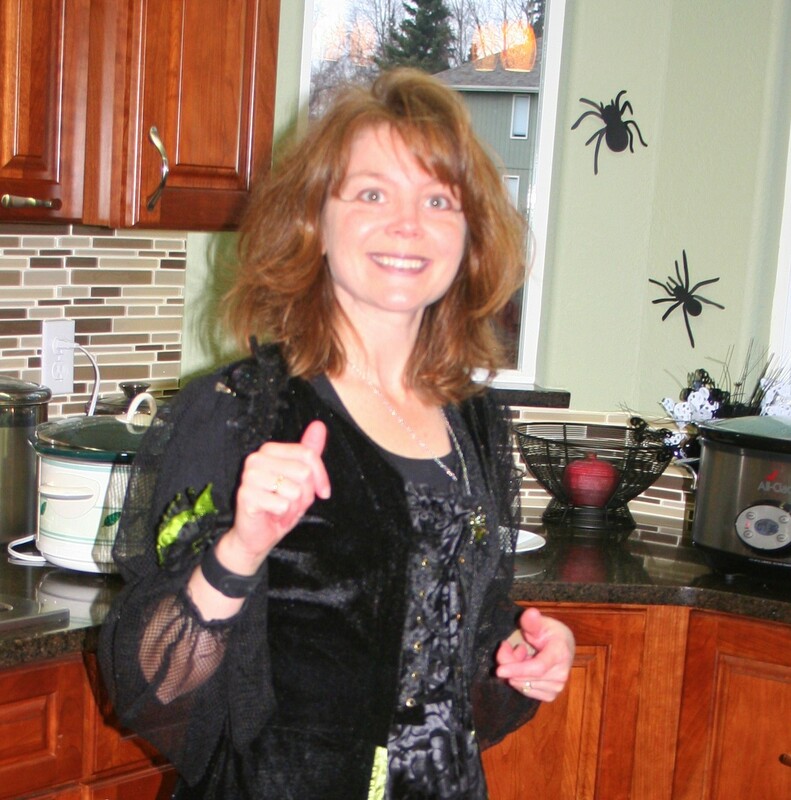 Thank you to Old Man Lawry, who supports his wife’s Halloween dreams and is a wizard with visqueen and a staple gun. And thank you to their brilliant little witch, who embodies the best in each of her parents. She is spunky, crafty, and wise. This party was a witch’s dream. Thank you, thank you!